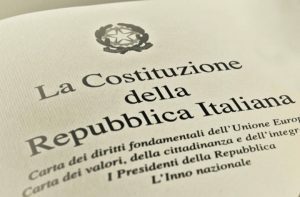 ".. è convinzione comune che il primo elemento della Costituzione è la persona umana, con tutti i suoi attributi, i suoi diritti, le sue tutele ed anche la sua dignità." The Constitutions Hall is a laboratory which hosts a permanent exposition of all Constitutional Texts (hard copy), from all around the world; Constitutions Hall is also a cultural and research hub which organizes and offers cultural actions and events on various topics. Constitutions Hall is a dynamic space where cultures, languages, values and philosophies melt together. The permanent exposition is one of the results of a research and development project, started under the scientific coordination of Prof. Gaetano Oliva, professor of "International Institutions and relations History" at Scuola Superiore Carolina Albasio in Castellanza (VA) and Professor at Università Cattolica del Sacro Cuore di Milano, Brescia e Piacenza. Prof. Gaetano Oliva is also director of the post-grad master degree "pedagogical actions and interactions through narrative and theatrical education", at the faculty of Education Sciences at Università Cattolica del Sacro Cuore di Milano and artistic director of CRT "Teatro Educazione" in Fagnano Olona (VA). The sources for the research and development activities are: embassies and consulates of the Nations in the world, Constitutional Courts, Universities, cultural centers, research centers, scientific foundations, libraries and associations.